WJJO staff visit WYOU studio as part of their Hump Day promotion. Local rock radio WJJO with winners in the WYOU studio. The WJJO Girls visit the WYOU studio. WYOU sharing booth space with WORT. 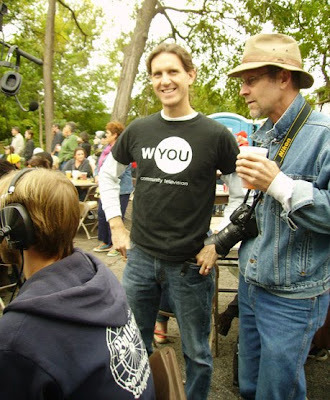 Labels: "WYOU" "Fighting Bob Fest"
Volunteer Glenn Pawelski greets visitors to the Fest. Eric, Heidi and Ann approve of the money raised for WYOU at the Orton Park Music Fest. Labels: "WYOU" "Orton Park Music Fest 2010"